Ok, so apparently nobody is very interested in the 30-day trial topic. Last night for a Halloween party I went as Myspace. 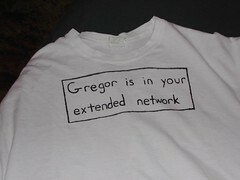 Simple costume: use a Sharpie to make a t-shirt that says “Gregor is in your extended network” on the front and “Sorry! 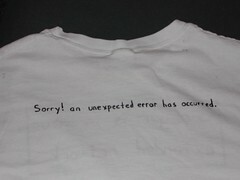 an unexpected error has occurred.” on the back. Then carry around labels for people to write comments on and stick them to me. 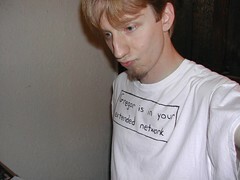 Of course, going as Myspace, it was only appropriate to take some “Myspace shots” in costume. You can see all of them on my flickr. i watched nightmare before christmas tonight. glad to see the costume was a hit! some of my co-workers and I are going as classmates.com photos... so we are carrying around frames with “Find your graduating class” and “What year did you graduate?” written on them and dressing up from various decades. Oh wait - that's tomorrow! I'm totally not ready and have no time to get a costume... oh, bother. Yes I do, it cuts down on fragment sentences, spelling errors and the like. I haven't had any problems with Firefox at home, and I use IE at work without any problems. That is interesting. Maybe you have some setting turned on that I don't. Now THAT is a great Halloween costume. You are just too cool. nice costume! also nice haircut, i love it! i watched wallace and gromit last night. it also has helena bonham carter. she's a little flaky. Did you know it took five years to make that movie? be selfish. i dare you. that is my favorite costume of the year.